From Art Smith comes a unique cookbook with more than 150 recipes to strengthen bonds between loved ones. Throughout history, humans have sat down together at the table to break bread. The simple ritual of the shared meal reunites us with our families and brings balance to our lives. There are many types of families--in using the word "family," Art means to include anyone whom we have sought or chosen to be an important part of our lives. Unfortunately, in today's fast-paced world, the symbolic role of the table has been threatened. In many households, family members all eat separately, according to their own schedules, on the run, or in front of the TV. 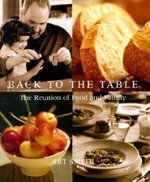 With this important cookbook, Art Smith wants to bring us back to the table--and back to each other. Art provides readers with mouth-watering recipes that represent the very best of home cooking, including Roasted Tomato and Cheddar Cornbread, to-die-for Sweet Potato-Pecan Waffles, hearty Seafood Gumbo, Grilled Shrimp on Arugula with Lemon Vinaigrette, and Spiced Pork Loin with Vidalia Onion Sauce, to name just a few. There is also a rich assortment of vegetable main courses--like Art's fabulous Italian Vegetable Casserole. Traditional dishes include the best-ever Buttermilk Fried Chicken and a Roast Turkey with Pan Gravy that's not just for Thanksgiving! And then there are the celebration cakes, perfect pies, and little sweets. From French Chocolate Almond Pie to Pear and Cranberry Cobbler, from Coconut Cake with Fluffy Icing to Triple-Layer German Chocolate Cake, from Pecan Divinity to Gumdrop Cookies, "Back to the Table" is filled with delicious treats for any occasion. Art's life's work has involved cooking for families all over the world. These experiences have taught him that families are essentially the same, regardless of international boundaries or cultural differences. We all want the best for each other and want to take care of the ones we love. And what better way is there to care for our loved ones than at the table? Illustrated throughout with stunning photographs of food and of people sharing their tables and their lives, "Back to the Table" is a book to use daily and to treasure for a lifetime.